Cap'n Transit Rides Again: Enough riders for what? In many discussions of transit feasibility, the question arises: will it attract enough riders? This can lead to some heated discussions, because not everyone agrees on what counts as enough. The most basic criterion for the transit rider is personal: I am enough. If the transit route takes me where I want to go when I want to go, and has enough room for me to sit down comfortably, I don't really care whether it has one person or none. From the transit manager's perspective, though, that's not good enough. Transit costs money to operate, so it needs enough riders to justify its operating expenses. If it doesn't attract them, the money will probably be spent somewhere else. For me as the rider that's bad news, although transit providers usually don't share that information with riders. Similarly, transit costs money to build and maintain, and it needs enough riders to justify its capital expenses. If it doesn't attract them, the money will probably be spent somewhere else. I've separated capital and operating expenses out, because they are usually separate decisions, often made by separate groups of people with different goals. Now we come to another question: what does it mean to justify operating or capital expenses? That depends on the goals of whoever is spending the money. Here's where the concept of "enough riders" really diverges. The easiest goal to understand is operating profit, and that's why so many people are fixated on it. It depends on the laws of supply and demand: can the service attract enough people, paying a high enough fare, to recoup the operating costs? Overall profit covers the operating costs and that service's share of the capital costs. Often with transit, especially these days, either the fare or the ridership or both are not high enough to earn an operating profit, let alone an overall profit. That means that the service is subsidized with the aim of achieving some other goal. After profit, the simplest goal is an internal one. Jarrett Walker discusses the value of network effects in transit, where running "empty" buses on off hours or in sparsely populated areas may increase ridership on popular routes or during peak times. What if your goal is reducing pollution or increasing efficiency? 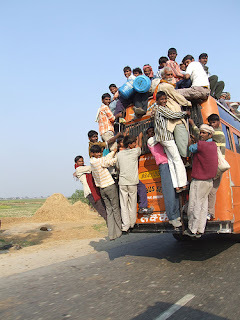 Despite what Eric Morris and Tom Rubin say, an average of eleven riders on a bus is enough to pollute less than a private car, according to a report (PDF) prepared for the Environmental Defense Fund; similar ridership levels can be calculated for other types of pollution and efficiency based on the data in that report. Of course, only riders who've shifted from driving count; riders who would otherwise have walked, ridden a bike, taken a different transit route or stayed at home don't reduce pollution or improve efficiency by taking this route. If your goal is reducing carnage, then you should know that a trained professional driver is less likely to crash than an amateur, so even one rider shifting from driving should improve safety, and it goes up from there. Whether the safety improvement is "enough" depends on how you value safety. If your goal is encouraging people to live, work and shop in walkable areas, maybe to improve your tax base Strong Towns-style, the effect per rider is really hard to measure, and it depends in part on whether you have park-and-rides. Car ownership levels or the price of walkable housing may be better indicators than transit ridership. If your goal is access for all, as a social justice measure, you need to drill down further. Are you concerned with access to work, shopping, social interaction, participation or social services? The best way to figure it out is to survey your population, and then it would depend on whether there are other ways of serving that population that are more efficient. Once you get past those bare minimum levels the question arises of what an acceptable return on your subsidy is. How much pollution reduction or energy efficiency is worth a hundred million in light rail tracks? How much carnage reduction, sales tax receipts or newly employed at-risk residents is worth a million dollars a year in bus driver salaries? The next thing is to keep in mind that it's almost always relative to an alternative. How much pollution reduction could you get by converting boilers to natural gas? How many seniors could you get to the doctor with a demand response system? There is also the compounding effect of the cycle. Each person who shifts from driving to transit not only helps to accomplish our goal, but also provides political and financial support to expand transit and reduce driving further. 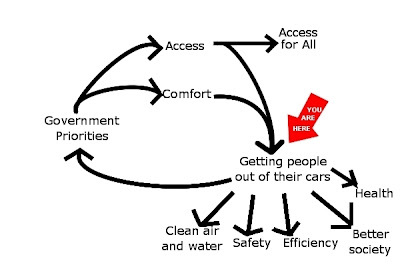 That said, there are other alternatives that get people out of their cars without building transit. Some of them may not only be cheaper than transit, they may be revenue-positive in that they involve cutting the road budget. These are some things to keep in mind the next time someone asks, "Will it attract enough riders?" While you're pondering them all, hit the ball back in their court by asking them, "Enough riders for what?" I like this post; you're making explicit the implicit assumptions that people make when they say these things. I think usually when people talk about enough riders the unspoken assumption that enough means enough that cost recovery is acceptable. People are usually unclear on what acceptable means in this context; in the US it doesn't mean >100%, but a lower number, which depends on what people are used to in their local area. To pull numbers partially ex recto, 40% might be very high in LA, but in New York people might insist on 60%, which means that 50% would be enough riders for LA pundits but not for New York ones. A second meaning of enough riders, also unspoken but common among the pundits, is enough relative to past projections. Most people don't understand cost per rider, but do understand cost overruns and ridership shortfalls. So if a line was projected to have 50,000 riders and gets 50,000 or more then it has enough riders, but if it gets only 30,000 then it doesn't. Long distance trains don't work?